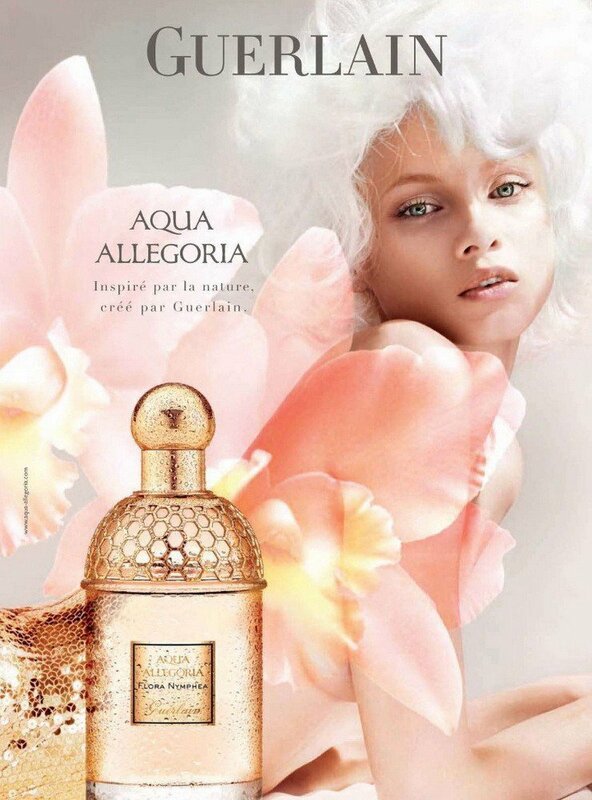 Aqua Allegoria Flora Nymphea is a perfume by Guerlain for women and was released in 2010. The scent is floral-fresh. The production was apparently discontinued. Not as green as I thought, for me honey dominates very much. I don't notice freshness, berries and citrus. I am thinking more of nectar, accompanied by orange blossom and lilac (for my nose the flowers go slightly in the Indolian direction). All in all, I get a green-influenced soft floral scent that looks very harmonious. The unmistakable Guerlinade gets through strongly in the base - unfortunately I don't like it. Another proof that I can't get warm with Guerlain scents. For me, the scent is a walk in May. It has just rained, the rainbow has faded, the now dry warm sunrays the lilac, the violets and the hyacinths. The scent is flowery, but light and full of suspicion, a little aquatic. I think the name 'Flora Nymphea' alludes to water lilies, at least that's their botanical name. The scent also reminds very much of water lily scent. Long shelf life and beautiful Sillage. I've been asked a lot about that. Too bad it was limited. Flora Nymphea came to me unexpectedly, a gift. The "benefactress" commented: "I always give what the recipient would never buy for himself." In fact, I wouldn't have bought it. I like flowers. I especially like lilac and orange blossom. But when it comes down to it, the others, the dark ones, the Orientals, the woody ones, the lascivious ones are always first. Whether when buying or when wearing, the flower fragrances somehow always pull the waiting mark. To put it directly: Flora Nymphea is interesting, unusual and beautiful to look at! But is Flora Nymphea also something for me? Immediately after spraying I smell citric freshness and lilac. The lilac is shimmering, purple, not quite blooming. And then, you can laugh at me, I smell tomato green. Leaves, stems... with ripe tomatoes hanging on it. And I like it a lot. I'm amazed how nicely this fits together. After approx. 10-12 minutes the scent becomes dense. The shimmering one sinks in the depth, because the citrus is no longer there. I recognize honey. At the moment it doesn't bother me, it's not sticky, it's not cute and it's not much. The orange blossom is also just a vague drawing. Up to this point, the fragrance was very fresh, beautiful and interesting. But then a spiciness creeps in, which is surely wanted and sense of the thing, but spoils my joy in a flower scent. It smells like five-spice powder, sweet-spicy. That doesn't go with tomato green, lilac or orange blossom. The spice harmonizes, in my opinion, only with the honey and increases its presence many times over. I see before me a mortar in which honey is dripping, golden and viscous, and its scent rises in my nose. Then the spice mixture is sprinkled pure, only a pinch of it. The tappet circles and the honey gets very warm. Then the lush lilac umbels and a handful of orange blossoms come in and are literally crushed. The mass becomes greyish-white. The tappet circles and circles, relentlessly. At this point, in summer heat, I get a headache and I get a little nauseous. It doesn't happen in colder weather and cold. I can't quite place this scent. It's not fresh for me (anymore), it's too spicy for that. It's not spicy the way I like, either. It's not light, but heavy, but it's not. Neither warm nor fresh. After a rather strenuous time, astringency and woodiness are added. The lilac is already very pale, but still it flashes from time to time. The honey becomes really aromatic, too much itself and I find it to be sticky. That'll keep it that way for my nose. The smell fades away without it becoming pleasant for me again. Somehow I never feel like that perfume. Too bad, really. I can see it's special. Unfortunately, I don't like it. Just like Picasso's pictures - I can look at them for a long time and see that they are actually ingenious. But I don't like them, nor would I hang them in the house. I've tried to turn it on someone a lot. Unfortunately, so far it has not found an owner who can work with him. House Guerlain is known for several enduring perfume classics and masterpieces, and it's no wonder perfume lovers often scoff at the Aqua Allegoria line. More often than not, the AA releases have not managed to live up to the house legacy of utter sophistication, consisting instead of several "nice" edts. Flora Nymphea is, for me, one of those "nice" scents that would make a worthy addition to any other perfume house's range, but for Guerlain, it falls short. It is a good sweet floral scent for anybody who is craving summer in a bottle -- this isn't the crisp dewiness of late spring/early summer, this is high summer at its peak when all the flowerbeds are filled with bugs and flowers begin to wither. The dominant feature of Flora Nymphea is straight-up honeyed linden blossom (not on the note list, but definitely what I smell). Whatever "green notes" or "citric notes" there are are overpowered by the sweet floral bouquet. The drydown comes pretty quickly with musky woods that lend the fragrance a soapy character towards the end -- not a bad thing, though! However nice it is, it isn't really in my taste, but lovers of sweet florals and honey take note. This is discontinued, but pretty well available through online discounters, often for very cheap. Glowing Hairspray. Not a criticism. I tried Flora Nymphea on a whim and it surprised me. I don’t think of the Aqua Allegorias as very complex in intent or execution. They’re the Post-It notes of French perfumery. So Nymphea took me by surprise. It’s linear, yes, but it’s complex enough to be conversational, long lasting and isn’t a one-liner. Every time I catch a whiff of it, it takes me to the very top notes of Guerlain’s Insolence edt. I know the hairspray feeling of Insolence’s start is derided, but I quite like it. I find it striking and appealing. Nymphea is a long-lasting play on that hairspray note. Guerlain's press describes this as a honeyed orange blossom and syringa. The only syringa I know is lilac, one of the spring scents I waited for all winter as a child. The combination of lilac and orange blossom makes for an interesting premise. A floral perfume is certainly nothing new, but taking these two flowers, who grow nowhere near each other, and juxtaposing them makes for an wonderful perfume. It's a great success for the Aqua Allegoria line. It demonstrates the difference between the simplistic, which others in the line can be fairly accused of, and simplicity. It’s poised and it’s full, and demonstrates that linearity can be an attribute and not an insult. This little bottle of pink juice was my introduction to the often maligned AA line from Guerlain, so I had very low expectations of it. I almost wanted to not like it. Fortunately, I was completely wrong. Aqua Allegoria Flora Nymphea is a delightful spring floral that is basically liquid happiness. Bright and flowery without being too intense. Just a wonderful, subtle, while at the same time childlike, innocent and beautiful scent. Honey and orange blossom fans should sample it for sure.